This page describes some methods for enabling MathML display on a variety of platforms. See the MathML Test page for an example on this Web site. MathML is important for accessibility and web standards because it allows equations to be stored as structured text. It can be reformatted with CSS, expanded with good resolution for low-vision users. Most importantly, is that if a screen reader can process MathML, a blind users can navigate and review parts of an equation, such as the top portion of a complex fraction. This section defines some terms that may help you understand MathML options better. MathML–MathML is a markup language designed to display equations ( (e.g. fractions, square roots, matrices, bounded integrals) on the Web and in other formats such as EPUB. namespace–the term "namespace" refers incorporating a link to the MathML specification typically in a tag such as the one below. The link enables some browsers to process MathML more accurately. m namespace–The term "m namespace" refers to an earlier MathML variant used by Microsoft. As only Internet Explorer ever recognized it, it is recommend to avoid using m namespace MathML unless there is an issue of backwards compatability with a particular student. display="block"-Add this attribute to the MATH tag is you want the equation to be on its own line. Remove it if you want to embed the MathML in a sentence. Older versions of JAWS use MathPlayer 3 inside Internet Explorer 9 (64 bit). Generally speaking, the most efficient way to generate MathML is to use an equation editor such as MathType (Windows/Mac) or other equation editor which supports MathML export. 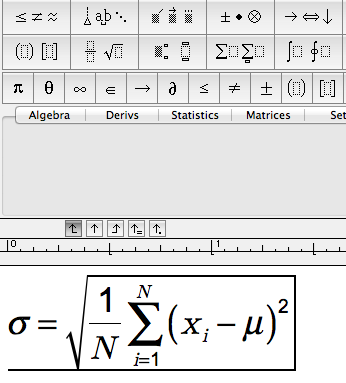 Note: The built in Microsoft Office equation editor does NOT support MathML. The MathType plugin is recommended for faculty working with equations in Word of PowerPoint. If you use LaTeX, then you would want a tool which converts LaTeX to MathML such as MathType or other online conversion utility. Here are instructions for creating and exporting MathML code from MathType (Win/Mac). Open Math Type 6 and use the template tools to build an equation. Go to the Preferences : Cut and Copy Menu… menu. Check the button for MathML or TeX option. Set the next menu to MathML 2.0 (namespace attr). Click OK to close the window. Copy the equation you have built. Use the link below for a page requiring a password to access. If you wish to a different version or configuration of MathJax, you can view the MathJax version list at Cloudfare. Please note that if you use a link with a config option, you may need to add MathJax.js? before the string /config. See sample link above for an example. Theoretically you can apply inline CSS attributes to both the MATH tag and individual tags (e.g. MFRAC, MROW, MO and others). However, MathJax interferes with that mechanism somewhat. With MathJax enabled, you can either apply inline styles to MathML tags or create custom classes. Click the Dashboard link to the site in which you need to MathML. Click the Plugins link in the left menu. Click the Activate link beneath the plugin for "MathJax-LaTeX". Note: If you activated the plugin before October 2014, you may want to Deactivate, then Activate. Click the Settings link beneath MathJax-LaTeX plugin. If necessary, uncheck the option Use MathJax CDN Service. Enter the following into the Custom MathJax Location? field. Note: You can remove the s in the URL if all your content is public. In the MathJax Configuration menu select TeX-AMS-MML_HTMLorMML. Create or open a Page or blog Post in your site. Click the Text tab to enter code view. Copy and paste MathML code with namespace link between the two tags. Note: Make sure that there are no blank lines in the MathML code. Click Publish to save content. Click View to verify content. Ensure that the Jetpack plugin is activated (requires a WordPress.com account). Instead of applying CSS to MathML tags, you need to apply CSS to MathJax plugin classes (e.g. .MathJax_Display). MathML can be automated in many platforms including Drupal ELMS. Check with your system administrator to learn more (they can contact us at accessibilityweb@psu.edu).